Homo naledi is an extinct species of hominin, which anthropologists first described in September 2015 and have assigned to the genus Homo. In 2013, fossil skeletons were found in the Gauteng province of South Africa, in a chamber of the Rising Star Cave system, part of the Cradle of Humankind World Heritage Site about 50 km (31 mi) northwest of Johannesburg. Although archaic features of its skeleton resembled fossil specimens roughly two million years old, in 2017 the fossils were dated close to 250,000 years ago, and thus contemporary with the first appearance of larger-brained anatomically modern humans. The research team therefore thinks that H. naledi is not a direct ancestor of modern humans, but probably an offshoot within the genus Homo. The species is characterised by a body mass and stature similar to small-bodied human populations, a smaller endocranial volume similar to Australopithecus, and a skull shape similar to early Homo species. The skeletal anatomy presents ancestral features known from australopithecines with more recent features associated with later hominins. As of 10 September 2015[update], fossils of at least fifteen individuals, amounting to more than 1550 specimens, have been excavated from the cave. Abundant fossil remains are still within the chamber. Newer findings (remains of at least three individuals: two adults and a child) in a second chamber, known as Lesedi ("light" in the Sotho-Tswana languages), were reported by John Hawks et al. (2017). In May 2018, anthropologists provided evidence that the brain of H. naledi was small, but nonetheless complex, sharing structural similarities with the modern human brain. The fossils were discovered by recreational cavers Rick Hunter and Steven Tucker in 2013 in the almost inaccessible Dinaledi Chamber ("chamber of stars" in the Sotho-Tswana language). Homo naledi was formally described in September 2015 by a 47-member international team of authors led by South African paleoanthropologist Lee Berger of the University of the Witwatersrand, who proposed that the bones represent a new Homo species. Other experts contend more analyses are needed to support this classification. There are some indications that the hominin bodies may have been deliberately placed in the cave near the time of their death. On 13 September 2013, while exploring the Rising Star cave system looking for an extension, recreational cavers Rick Hunter and Steven Tucker of the Speleological Exploration Club (SEC) of South Africa found a narrow, vertically oriented "chimney" or "chute", measuring 12 m (39 ft) long with a very narrow width tightening in places to as small as approximately 20 cm (7.9 in). This chute led to a room 30 m (98 ft) underground (Site UW-101, the Dinaledi Chamber), the surface of which was littered with fossil bones. Before exploring the cave that day, the cavers had been asked by fellow caver and geologist Pedro Boshoff to let him know if they came across any fossils. On 1 October 2013, photographs were shown to Boshoff, who recognised their significance and delivered them to Lee Berger. In November 2013, the National Geographic Society and the University of the Witwatersrand funded the Rising Star Expedition, a twenty-one-day excavation at the cave, followed by a second expedition in March 2014 for a 4-week-excavation in the Dinaledi Chamber. In total, more than 1,550 pieces of bone belonging to at least fifteen individuals have been recovered from the clay-rich sediments. The layered distribution of the bones suggests that they had been deposited over a long time, perhaps centuries. Only one square metre of the cave chamber has been excavated; other remains might still be there. Around 300 bone fragments were collected from the surface of the Dinaledi Chamber, and ∼1250 fossil specimens were recovered by excavation. The fossils include skulls, jaws, ribs, teeth, bones of an almost complete foot, of a hand, and of an inner ear. The bones of old, young, and infants were found. Although much of the fossil material is disarticulated (separated at joints), the deposit contains articulated or near-articulated examples such as the maxilla and mandible of single individuals and the bones of a nearly complete hand and foot. The description of the new species was announced at a press conference on 10 September 2015 held at Maropeng, Cradle of Humankind, Johannesburg, South Africa. A display case of the fossils was unveiled during the ceremony and subsequently, was on display to the public at Maropeng throughout September and October 2015. The University of the Witwatersrand is the curator of the fossils. The fossils are owned by the Republic of South Africa and will likely stay there in accordance with a 1998 resolution by the International Association for the Study of Human Paleontology, also approved by a South African permanent council member of the organisation – "strongly recommending that original hominid fossils not be transported beyond the boundaries of the country of origin, unless there are compelling scientific reasons which must include the demonstration that the proposed investigations cannot proceed in the foreseeable future in the country of origin". The physical characteristics of H. naledi are described as having traits similar to the genus Australopithecus, mixed with traits more characteristic of the genus Homo, and traits not known in other hominin species. The skeletal anatomy displays plesiomorphic ("ancestral") features found in the australopithecines and more apomorphic ("derived," or traits arising separately from the ancestral state) features known from later hominins. Adult males are estimated to have stood around 150 cm (5 ft) tall and weighed around 45 kg (100 lb), while females would likely have been a little shorter and weighed a little less. An analysis of H. naledi's skeleton suggests it stood upright and was bipedal. Its hip mechanics, the flared shape of the pelvis are similar to australopithecines, but its legs, feet and ankles are more similar to the genus Homo. The hands of H. naledi appear to have been better suited for object manipulation than those of australopithecines. Some of the bones resemble modern human bones, but other bones are more primitive than Australopithecus, an early ancestor of humans. The thumb, wrist, and palm bones are modern-like while the fingers are curved, more australopithecine, and useful for climbing. The shoulders are configured largely like those of australopithecines. The vertebrae are most similar to Pleistocene members of the genus Homo, whereas the ribcage is wide distally as is A. afarensis. The arm has an Australopithecus-similar shoulder and fingers and a Homo-similar wrist and palm. The structure of the upper body seems to have been more primitive than that of other members of the genus Homo, even apelike. In evolutionary biology, such a mixture of features is known as an anatomical mosaic. Four skulls were discovered in the Dinaledi chamber, thought to be two females and two males, with a cranial volume of 560 cm3 (34 cu in) for the males and 465 cm3 (28.4 cu in) for females, about 40% to 45% the volume of modern human skulls; average Homo erectus skulls are 900 cm3 (55 cu in). A fifth, male skull found in the Lesedi chamber has a larger estimated cranial volume of 610 cm3 (37 cu in). The H. naledi skulls are closer in cranial volume to australopithecine skulls. Nonetheless, the cranial structure is described as more similar to those found in the genus Homo than to australopithecines, particularly in its slender features, and the presence of temporal and occipital bossing, and the fact that the skulls do not narrow in behind the eye-sockets. The brains of the species were markedly smaller than modern Homo sapiens, measuring between 450 and 610 cm3 (27–37 cu in). The teeth and mandible musculature are much smaller than those of most australopithecines, which suggests a diet that did not require heavy mastication. While its molars were as complex and sharp as other South African hominins (Australopithecus africanus, Paranthropus robustus, and South African early Homo), they were relatively taller crowned and more wear resistant, implying Homo naledi had a distinct dietary ecology from other hominins and consumed foods that wore its teeth faster, either because the foods contained more internal abrasives, such as phytoliths, or external abrasives, such as dust or grit. The teeth are small, similar to modern humans, but the third molar is larger than the other molars, similar to australopithecines. The teeth have both primitive and derived dental development, yet, they provide additional support for the taxonomic validity of H. naledi as a distinct species of Homo. Analyses of excavated middle-ear bones called incus, show that morphologically and metrically, the tiny bones resemble those of chimpanzees, gorillas, and Paranthropus robustus more than they do later members of the genus Homo. The overall anatomical structure of the species has prompted the investigating scientists to classify the species within the genus Homo, rather than within the genus Australopithecus. The H. naledi skeletons indicate that the origins of the genus Homo were complex and may be polyphyletic (hybrid), and that the species may have evolved separately in different parts of Africa. A reconstruction of a model of a H. naledi head was made by measuring the bones of the head, the eye sockets, and where the jaw muscles insert to the skull. The measurements were used to make the model, including skin, eyes, and hair. In May 2018, anthropologists provided evidence that the brain of H. naledi was small, but nonetheless complex, sharing structural similarities with the modern human brain. Almost half of H. naledi teeth have one or more chip on the enamel surface, caused by teeth coming into contact with hard foods or environmental grit during life. These antemortem fractures are predominantly small and on the surfaces between molars, suggesting either a small hard dietary item was commonly consumed, or, more likely, environmental grit was incorporated into their diet when eating foods such as tubers. Two other studies support the suggestion that H. naledi consumed large quantities of small hard objects, most likely in the form of dust or grit. Crown shape supports this finding, with taller crowned and more wear resistant molars, potentially evolving to protect against abrasive particles. Microwear on the molars of H. naledi also suggests they regularly consumed hard and abrasive items. Overall, it is likely H. naledi differed substantially from other African fossil hominins in terms of diet, behaviour, or masticatory processing. The bones were found lying on the cave floor or buried in its claylike sediments ("mud clast breccias") interspersed with layers of deposited calcite flowstone. Geologists estimate that the cave in which the fossils were discovered is no older than three million years. The discovery team waited until after the research article was published before trying radiocarbon dating because the technique destroys parts of the fossils. Radiocarbon dating can only date fossils which are less than 50,000 years old. Francis Thackeray, of the University of the Witwatersrand, suggested that H. naledi lived 2 ± 0.5 million years ago, based on the skulls' similarities to H. rudolfensis, H. erectus, and H. habilis, species that existed around 1.5, 2.5, and 1.8 million years ago, respectively. Early estimates derived from statistical analysis of cranial traits yielded a range of 2 million years to 912,000 years before present. During 2016, members of the team worked on determining the geological age of the fossil deposit, applying techniques that can be used to date the site's flowstones, and in the paper Dirks et al. (2017) announced a much more recent age range of between 335,000 and 236,000 years ago from dating fossil teeth, sediments encasing the fossils and overlying flowstone. They used a variety of dating techniques, including radiocarbon dating of teeth, optically stimulated luminescence of sediment, palaeomagnetic analysis of flowstone, and most conclusively, uranium-thorium dating of cave flowstone and teeth and electron spin resonance dating of teeth. The latter two types of measurements of teeth were performed on blind duplicate samples by two different labs. This age obtained from the dating is surprisingly young, as earlier estimates based on the appearance were an order of magnitude older. No similarly small-brained hominins had previously been known from such a recent date in Africa. (The even smaller-brained Homo floresiensis of Indonesia lived on an isolated island and apparently went extinct shortly after the arrival of modern humans.) The species is interpreted as an early-branching, and possibly basal offshoot within the diversification of Homo. The mosaic anatomy of H. naledi, combining more ancestral with more recently evolved features, might be the product of hybridization between different hominin lineages. The ability of such a small-brained hominin to survive for so long in the midst of more advanced members of Homo will require a revision of previous conceptions of human evolution. Ancient DNA in the fossils was found to be degraded (including cross-linking, deamination and fragmentation) and attempts to extract it from H. naledi remains have thus far proven unsuccessful. Ancient DNA preservation depends on many different variables, such as the UV radiation, pH, temperature the remains have been subjected to, and the amount of water, salinity, microbes, and oxygen present in the depositional context. Future research and developments regarding ancient DNA repair may or may not succeed in revealing H. naledi's genome for study. The research team proposes the bones represent a new species, H. naledi in the genus Homo; other experts contend further analyses are needed to support this classification. New York University anthropologist Susan Anton stated that even after dating, experts would likely spend many years striving to put these fossils in the proper context because there is no consensus in paleoanthropology about exactly how such comparisons are used to define the genus Homo. "Some would argue that striding bipedalism is a defining feature, so that being Homo means using a specific way of moving around the environment. Other scholars may look more to cranial characteristics as Homo family features." Bernard Wood, a paleoanthropologist at the George Washington University, agrees the remains represent a new species, but thinks the bones may represent a relict population that may have evolved in near isolation in South Africa, similar to another relict population, a small-brained species of Homo floresiensis from the island of Flores in Indonesia. With the number of individuals, and the sexes and age groups represented, scientists consider the find to be the richest assemblage of associated fossil hominins ever discovered in Africa, and aside from the Sima de los Huesos collection and later Neanderthal and modern human samples, the excavation site has the most comprehensive representation of skeletal elements across the lifespan, and from multiple individuals, in the hominin fossil record. Jeffrey H. Schwartz, an evolutionary biologist at the University of Pittsburgh in Pennsylvania, argues that the material is too varied to represent a single species. Paleoanthopologist Tim D. White thinks that, based on the published descriptions, the fossils belong to a primitive Homo erectus. Anthropologist Chris Stringer also stated that the fossils look most similar to the small-bodied examples of Homo erectus from Dmanisi in Georgia, which have been dated at ∼1.8 million years old. Berger rejected the possibility of the fossils representing H. erectus at the announcement news conference. S. V. Drobyshevskiy identifies remains of H. naledi with Homo ergaster fossils from Swartkrans. There are some indications the individuals may have been deliberately placed in the cave near the time of their death, and experts state more evidence is needed to support this hypothesis. Anthropologist John D. Hawks, from the University of Wisconsin–Madison who was a member of the team, stated that the scientific facts are that all the bones recovered are hominid, except for those of one owl; there are no signs of predation, and there is no predator that accumulates only hominids this way; the bones did not accumulate there all at once. There is no evidence of rocks or sediment having dropped into the cave from any opening in the surface, and no evidence of water flowing into the cave carrying the bones into the cave. Hawks concluded that the best hypothesis is that the bodies were deliberately placed in the cave after death, by other members of the species. Dirks et al. say that "Mono-specific assemblages have been described from Tertiary and Mesozoic vertebrate fossil sites (...), linked to catastrophic events (...) Among deposits of non H. sapiens hominins, where evidence of catastrophic events is lacking, mono-specific assemblages have been associated typically with deliberate cultural deposition or burial". They stated that there is no evidence a catastrophe placed the bodies in the cave, and that the bodies were deliberately placed in cave. William Jungers, anatomical scientist at Stony Brook University, does not dispute that the H. naledi bones belong in the genus Homo and were likely deposited deliberately, but he cautions against trying to argue for "complex social organization and symbolic behaviors." He suggests that "Dumping conspecifics down a hole may be better than letting them decay around you." He speculates that in the past there may have been another, easier, way to access the chamber where the bones were found. Dirks et al. mentions that there is insufficient evidence to suggest the existence of an alternate and easier access route from the surface to the Denaledi Chamber. Carol Ward, professor of pathology and anatomical sciences at the University of Missouri, is also sceptical of the intentional burial explanation and asked, "If it’s really that hard to get to the cave, how do you get to that long dark cave carrying your dead grandmother?" Berger thinks that deliberate disposal of bodies within the intricate cave system would have required the species members to find their way through total darkness and back again, and he speculates that this would have required light in the form of torches or fires lit at intervals. Aurore Val argues the team has yet to make a convincing case on their deliberate placement hypothesis. Several aspects of the fossilization process (taphonomy) indicate that the remains did not enter the chamber in a single instantaneous event. Berger et al. suggest that "these individuals were capable of ritual behaviour". They speculate the placing of dead bodies in the cave was a ritualistic behaviour, a sign of symbolic thought. "Ritual" here means an intentional and repeated practice (disposing of dead bodies in the cave), and not implying any type of religious ritual. The date of emergence of ritualistic behavior in human prehistory is controversial, and all evidence for symbolic behaviour before the beginning of the Upper Palaeolithic about 50,000 years ago is debated. There is no evidence of material culture, like tools, or any evidence any kind of symbolic ritual that we almost always associated with burial. ...These bodies seem to have simply been dropped down a hole and disposed of." Every previously known case of cultural deposition has been attributed to species of the genus Homo with cranial capacities (brain size) near the modern human range, and unlike the Dinaledi assemblage, each of these hominin associated occurrences also contains at least some medium- to large-sized, non-hominin fauna. William Jungers has raised similar concerns regarding the hypothesis. Science writer Michael Shermer suggests considering homicide, war, and even sacrifice as the cause of death, but John D. Hawks, one of the scientists who categorised and analysed the fossils, notes that there is no evidence for a violent death among the bodies. Palaeontologists Tim White and Christoph Zollikofer think that the fossils were excavated too fast to protect them from damage, in a desire to get publicity, and that the findings were not examined and peer-reviewed sufficiently before publishing. Lee Berger disputes these opinions and considers that the openness of the excavation, the analysis, publishing and availability of the fossils used valid methods. A PBS NOVA National Geographic documentary Dawn of Humanity, describing the discovery of H. naledi, was posted online on 10 September 2015, and broadcast nationwide in the United States on 16 September 2015. According to archaeologist K. Kris Hirst, the Dawn of Humanity documentary film provides "a rich context for the discovery [of the fossils of Homo naledi], setting the historical and evolutionary background so that viewers can understand the significance of the discovery." The National Geographic Society has videos on its website describing, explaining and showing different phases of the discovery, the scientists, the six women excavators able to access the chamber (the "Underground Astronauts"), excavation of the fossils during a two-year period, and the process of making a model of a head of H. naledi from the fossils. Lee Berger introduces Homo naledi in a Wits University video. ^ a b c d Dirks, Paul H.G.M. ; Roberts, Eric M.; et al. (9 May 2017). "The age of Homo naledi and associated sediments in the Rising Star Cave, South Africa". eLife. 6: e24231. doi:10.7554/eLife.24231. PMC 5423772. PMID 28483040. ^ a b c d e f g h i j k l m n o p Berger, Lee R.; et al. (10 September 2015). "Homo naledi, a new species of the genus Homo from the Dinaledi Chamber, South Africa". eLife. 4. doi:10.7554/eLife.09560. PMC 4559886. PMID 26354291. Lay summary. If the fossils prove to be substantially older than 2 million years, H. naledi would be the earliest example of our genus that is more than a single isolated fragment. [...] A date younger than 1 million years ago would demonstrate the coexistence of multiple Homo morphs in Africa, including this small-brained form, into the later periods of human evolution. ^ a b c d e f g h i j k l m Shreeve, Jamie (10 September 2015). "This Face Changes the Human Story. But How?". National Geographic News. Retrieved 10 September 2015. ^ a b c d Berger, L. R.; Hawks, J.; Dirks, P. HGM; Elliott, M.; Roberts, E. M. (9 May 2017). "Homo naledi and Pleistocene hominin evolution in subequatorial Africa". eLife. 6. doi:10.7554/eLife.24234. PMC 5423770. PMID 28483041. ^ a b Hawks, John; Elliott, Marina; et al. (9 May 2017). "New fossil remains of Homo naledi from the Lesedi Chamber, South Africa". eLife. 6: e24232. doi:10.7554/eLife.24232. PMC 5423776. PMID 28483039. ^ a b St. Fleur, Nicholas (14 May 2018). "Tiny Brains of Extinct Human Relative Had Complex Features". The New York Times. Retrieved 14 May 2018. ^ a b Holloway, Ralph L.; Hurst, Shawn D.; Garvin, Heather M.; Schoenemann, P. Thomas; Vanti, William B.; Berger, Lee R.; Hawks, John (2018). "Endocast morphology of Homo naledi from the Dinaledi Chamber, South Africa". Proceedings of the National Academy of Sciences. 115 (22): 5738–5743. doi:10.1073/pnas.1720842115. PMC 5984505. PMID 29760068. ^ a b c d Dirks, Paul H. G. M.; et al. (10 September 2015). "Geological and taphonomic context for the new hominin species Homo naledi from the Dinaledi Chamber, South Africa". eLife. 4: e09561. doi:10.7554/eLife.09561. ISSN 2050-084X. PMC 4559842. PMID 26354289. ^ a b c Tucker, Steven (13 November 2013). "Rising Star Expedition". Speleological Exploration Club. Retrieved 8 September 2015. ^ a b c d Dirks, Paul HGM; Berger, Lee R.; Roberts, Eric M.; Kramers, Jan D.; Hawks, John; Randolph-Quinney, Patrick S.; Elliott, Marina; Musiba, Charles M.; Churchill, Steven E. (10 September 2015). "Geological and taphonomic context for the new hominin species Homo naledi from the Dinaledi Chamber, South Africa". eLife. 4: e09561. doi:10.7554/eLife.09561. ISSN 2050-084X. PMC 4559842. PMID 26354289. ^ "The New Kid on the Block". Retrieved 6 July 2016. ^ a b Yong, Ed (10 September 2015). "6 Tiny Cavers, 15 Odd Skeletons, and 1 Amazing New Species of Ancient Human". The Atlantic. Retrieved 13 September 2015. ^ a b c Bascomb, Bobby (10 September 2015). "Archaeology's Disputed Genius". PBS. Retrieved 22 September 2015. ^ Howley, Andrew (6 November 2013). "Rising Star Expedition: Prehistory in the Making". National Geographic Society. Retrieved 8 September 2015. ^ a b Greenfieldboyce, Nell (10 September 2015). 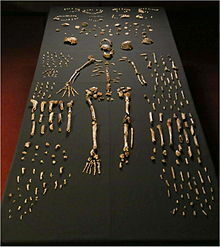 "South African Cave Yields Strange Bones Of Early Human-Like Species". NPR. Retrieved 10 September 2015. ^ Alford, Justine (10 September 2015). "New Species Of Human Discovered In South Africa". IFLScience. Archived from the original on 24 May 2016. Retrieved 17 May 2017. ^ Shreeve, Jamie (10 September 2015). "New Human Ancestor Elicits Awe—and Many Questions". National Geographic Society. Retrieved 17 September 2015. ^ Feltman, Rachel (10 September 2015). "Meet the six female 'underground astronauts' who recovered our newest relative". Washington Post. Retrieved 10 September 2015. ^ Gembara, Deborah (10 September 2015). "New species with human features found in South Africa". Reuters (Internet video with transcript). Retrieved 15 September 2015. ^ "Naledi Fossils" (Embedded video from YouTube). Gauteng Tourism Authority. Retrieved 6 July 2016. ^ a b Nutt, Amy Ellis (10 September 2015). "Scientists shocked the world with a brand new species of man — but who owns the bones?". Washington Post. Retrieved 10 September 2015. ^ International Association for the Study of Human Paleontology (1999). "Resolution regarding the transport of hominid fossils beyond the country of origin" (PDF). Journal of Human Evolution (36). p. 459. ^ Hooper, Rowan (10 September 2015). "Homo naledi: Unanswered questions about the newest human species". New Scientist. Retrieved 8 October 2015. ^ Harcourt-Smith, W. E. H.; Throckmorton, Z.; Congdon, K. A.; Zipfel, B.; Deane, A. S.; Drapeau, M. S. M.; Churchill, S. E.; Berger, L. R.; DeSilva, J. M. (2015). "The foot of Homo naledi". Nature Communications. 6: 8432. doi:10.1038/ncomms9432. PMC 4600720. PMID 26439101. ^ a b c d e Wong, Kate (10 September 2015). "Mysterious New Human Species Emerges from Heap of Fossils". Scientific American. Retrieved 10 September 2015. ^ Kivell, Tracy L.; Deane, Andrew S.; Tocheri, Matthew W.; Orr, Caley M.; Schmid, Peter; Hawks, John; Berger, Lee R.; Churchill, Steven E. (2015). "The hand of Homo naledi". Nature Communications. 6: 8431. doi:10.1038/ncomms9431. PMC 4597335. PMID 26441219. ^ Cofran, Zhongtao; Skinner, M. M.; Walker, C. S. (2016). "Dental development and life history in Homo naledi". American Journal of Physical Anthropology. 159: 3–346. doi:10.1002/ajpa.22955. PMID 26914367. ^ a b c Stringer, Chris (10 September 2015). "The many mysteries of Homo naledi". eLife. 4: e10627. doi:10.7554/eLife.10627. ISSN 2050-084X. PMC 4559885. PMID 26354290. ^ Hogenboom, Melissa (13 October 2015). "Human Evolution Was Shaped By Interbreeding". BBC News. Retrieved 13 October 2015. ^ Becker, Rachel A. (14 September 2015). "Meet the Man Who Gives Ancient Human Ancestors Their Faces". National Geographic News. Retrieved 14 September 2015. ^ a b c Towle, Ian; Irish, Joel D.; Groote, Isabelle De (2017). "Behavioral inferences from the high levels of dental chipping in Homo naledi" (PDF). American Journal of Physical Anthropology. 164 (1): 184–192. doi:10.1002/ajpa.23250. ISSN 1096-8644. PMID 28542710. ^ Ungar, Peter S.; Berger, Lee R. (2018). "Brief communication: Dental microwear and diet of Homo naledi". American Journal of Physical Anthropology. 166 (1): 228–235. doi:10.1002/ajpa.23418. ISSN 1096-8644. PMID 29399788. ^ a b Wilford, John Noble (10 September 2015). "New Species in Human Lineage Is Found in a South African Cave". New York Times. ISSN 0362-4331. Retrieved 10 September 2015. ^ a b Sample, Ian (10 September 2015). "Homo naledi: New species of ancient human discovered, claim scientists". The Guardian. Retrieved 10 September 2015. ^ a b c d Handwerk, Brian (11 September 2015). "What Makes a Fossil a Member of the Human Family Tree?". Smithsonian. Retrieved 14 September 2015. ^ a b Yong, Ed (14 September 2015). "Why Don't We Know The Age of the New Ancient Human?". The Atlantic. Retrieved 14 September 2015. ^ Thackeray, Francis (25 November 2015). "Homo naledi may be two million years old (give or take)". The Conversation. Retrieved 30 November 2015. ^ Thackeray, J. Francis (2015). "Estimating the age and affinities of Homo naledi". South African Journal of Science. 111 (11/12). doi:10.17159/sajs.2015/a0124. ^ Dembo, Mana; Radovčić, Davorka; Garvin, Heather M.; Laird, Myra F.; Schroeder, Lauren; Scott, Jill E.; Brophy, Juliet; Ackermann, Rebecca R.; Musiba, Chares M. (1 August 2016). "The evolutionary relationships and age of Homo naledi: An assessment using dated Bayesian phylogenetic methods". Journal of Human Evolution. 97: 17–26. doi:10.1016/j.jhevol.2016.04.008. hdl:2164/8796. PMID 27457542. ^ Thackeray, J. Francis; Institute, Evolutionary Studies; Witwatersrand, University of the; Johannesburg; Africa, South (11 October 2015). "English". South African Journal of Science. 111 (11/12). doi:10.17159/sajs.2015/a0124. ISSN 1996-7489. ^ Hawks, John (July–August 2016). "The Latest on Homo naledi". American Scientist. 104 (4): 198. doi:10.1511/2016.121.198. Retrieved 17 May 2017. ^ Barras, Colin (25 April 2017). "Homo naledi is only 250,000 years old – here's why that matters". New Scientist. Retrieved 26 April 2017. ^ Sutikna, T.; Tocheri, M. W.; Morwood, M. J.; Saptomo, E. W.; Jatmiko; Awe, R. D.; Wasisto, S.; Westaway, K. E.; Aubert, M.; Li, B.; Zhao, J.; Storey, M.; Alloway, B. V.; Morley, M. W.; Meijer, H. J. M.; van den Bergh, G. D.; Grün, R.; Dosseto, A.; Brumm, A.; Jungers, W. L.; Roberts, R. G. (30 March 2016). "Revised stratigraphy and chronology for Homo floresiensis at Liang Bua in Indonesia". Nature. 532 (7599): 366–369. doi:10.1038/nature17179. PMID 27027286. ^ a b Homo naledi genome: Will we ever find this elusive key to human evolution? Jennifer Raff, The Guardian. 23 May 2017. ^ Callaway, Ewen (17 September 2015). "Crowdsourcing digs up an early human species". Nature. 525 (7569): 297–298. doi:10.1038/nature.2015.18305. PMID 26381960. ^ AP News (10 September 2015). "Bones of Homo naledi, new human relative, found in South African cave". CBC News. Retrieved 17 September 2015. ^ Drobyshevskiy, Stanislav (1 August 2016). "Вспоминая телантропов: крах "теории Homo naledi"?" [Remembering telantropov: the collapse of the "Homo naledi theory"?]. Antropogenez (in Russian). Retrieved 17 May 2017. ^ Drake, Nadia (15 September 2015). "Mystery Lingers Over Ritual Behavior of New Human Ancestor". National Geographic News. Retrieved 16 September 2015. ^ Bascomb, Bobby (10 September 2015). "New Homo Species Found". The Scientist. Retrieved 22 September 2015. ^ McKensie, David (10 September 2015). "Homo naledi: Scientists find ancient human relative" (Video (02:43)). CNN. Retrieved 13 September 2015. ^ Wong, Kate. "Debate Erupts over Strange New Human Species". Scientific American. Retrieved 9 April 2016. ^ Val, Aurore (31 March 2016). "Deliberate body disposal by hominins in the Dinaledi Chamber, Cradle of Humankind, South Africa?". Journal of Human Evolution. 96: 145–148. doi:10.1016/j.jhevol.2016.02.004. PMID 27039664. ^ Ghosh, Pallab (10 September 2015). "New human-like species discovered in S Africa". BBC News. Retrieved 10 September 2015. ^ Shermer, Michael (1 January 2016). "Did This Extinct Human Species Commit Homicide?". Scientific American. 314: 75. doi:10.1038/scientificamerican0116-75. ^ Hawks, John (2 January 2016). "Michael Shermer: Murdering the facts about Homo naledi?". John Hawks Weblog. Retrieved 2 January 2016. ^ a b McKie, Robin (24 October 2015). "Scientist who found new human species accused of playing fast and loose with the truth". The Guardian. Retrieved 25 October 2015. ^ "Archaeology's Disputed Genius — NOVA Next | PBS". NOVA Next. Retrieved 25 October 2015. ^ Staff. "Dawn of Humanity". PBS. Retrieved 10 September 2015. ^ Hirst, K. Kris (2015). "The Dawn of Humanity – Newly Discovered Homo naledi Video Review – Accessible Science on the Rising Star Paleolithic Site". About.com. Retrieved 13 September 2015. ^ Staff (10 September 2015). "New Human Ancestor Discovered: Homo naledi (Exclusive Video)". National Geographic Society. Retrieved 14 September 2015. ^ Bryner, Jeanna (10 September 2015). "In Photos: New human Relative Shakes Up Our family Tree". LiveScience. Retrieved 16 September 2015. Berger, L. R.; Hawks, J. (2017). Almost human: the astonishing tale of Homo naledi and the discovery that changed our human story. Washington, DC: National Geographic Society. ISBN 978-1-4262-1811-8. This page is based on the Wikipedia article Homo naledi; it is used under the Creative Commons Attribution-ShareAlike 3.0 Unported License (CC-BY-SA). You may redistribute it, verbatim or modified, providing that you comply with the terms of the CC-BY-SA.